Their names were, HMA Ships Stuart, Voyager, Vampire, Vendetta and Waterhen. No more thrilling actions were fought in World War 11 than those fought in the Medtterratiean and Far East, and in these savage tussles five over aged Australian destroyers played a glorious part.. "Scrap-Iron Flotilla" is the story of these five ships. Scouring Italy’s "Mare Nostrum" from South to North and from East to West. They fought countless fiery actions with surface craft, submarines and the Luftwaffe's deadliest planes. "This is a factual story. I say this at the outset because you may feel that no five ships could get into (and out of!) so much trouble in such a short time. These five did. I served in one of them in the quieter days that followed the storm. There was bountiful evidence of the part she had played, captured Breda guns, Fiat guns, rifles, glasses, knives. Often the men gathered in groups in the messdecks to spin “dits” about the more hectic times. It seemed unfair that nothing had been written about them, and so this book was born. "Scrap-Iron Flotilla" is the story of these five ships. Scouring Italy’s "Mare Nostrum" From South to North and from East to West. They fought countless fiery actions with surface craft, submarines and the Luftwaffe's deadliest planes. Of these five HMAS Waterhen was sunk, but the remaining 4 destroyers sailed back home to Australia to do battle with the Japanese in the Far East. The Story of the "Scrap-Iron Flotilla is the story of Matapan and Calabria, of evacuation from Greece and Crete and of the immortal "Tobruk Ferry Service". It is the story too, of the war against Japan and the loss of HM Ships Prince Of Wales and Repulse. There are brilliant first hand accounts of some of the war's most fiery encounters, but there is humour too, even in the midst of battle. It was not an easy story to write. Action and humour and dull monotony toppled over one another in a crazy procession. Some things had to be omitted for security reasons; others because there was not enough room for the whole tale. Some ships received a little more attention than others. And, finally, many of the officers and men whose stories are told must, perforce, remain anonymous. However, here it is, dedicated to the ships, officers and men of the “Scrap-iron Flotilla”. Very little has been written in length about the famous "Scrap Iron Flotilla" and their achievements in the Mediterranean and Far East during those dark, early days of World War Two. Most history books relegate them well down the list behind the more formidable and well known 'battlewagons'. However, when Britain stood alone with her back to the wall against the might of Nazi Germany the 'Scrap Iron Flotilla' took on all comers. I make no apologies for the lack of today's political correctness in the text you are about to read, nothing has been altered from the original book text. The reader should keep in mind that the following was written between 1942-44, when Australia was still very much at war, in all theatres across the globe. 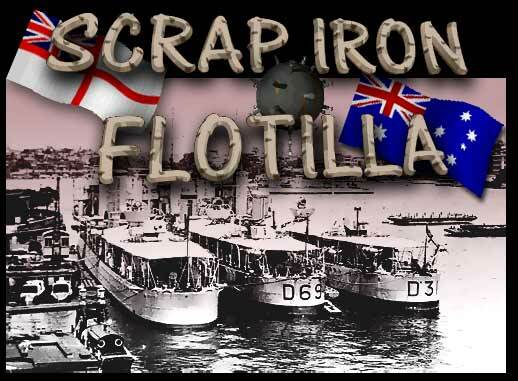 The Webmaster would like to acknowledge the marvellous works of Mr. John F. Moyes' "Scrap Iron Flotilla" and for making it possible for future generations of Australians to share in this unique piece of Australian Naval and Military history. So ......"Close up and clear away for action! ", as you sail into battle with the R.A.N. in "The Scrap Iron Flotilla".